PFF Data Scientists Eric Eager and George Chahrouri discuss Tyler Dunne's article about the Green Bay Packers, Russell Wilson's trade value, 2019 Win Totals and the Detroit Lions 2019 Draft Strategy. 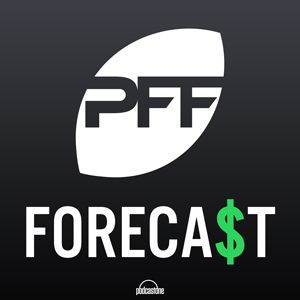 PFF Data scientists Eric Eager and George Chahrouri discuss NFL rule changes, the Jacksonville Jaguars offseason, draft strategy and recent free agency signings. PFF data scientists Eric Eager and George Chahrouri discuss their time at the 2019 NFL Combine. Eric and George also discuss the Jason Witten news, Kyler Murray's measurables, and read some viewer comments. PFF Data Scientists Eric Eager and George Chahrouri take a look at some of the big stories around the NFL and discuss what the New York Jets' should do this off-season.